Share the post "Chocolatey Pudding Fondant"
What a delightful after-dinner sweet! This chocolate pudding ups the ante and is a nice alternative to the tired chocolate fondue dessert. Preheat oven to 325 F. Use the butter to grease 4 large ramekins and place parchment paper in each. Grease the papers with butter and lightly dust with cocoa. Place a small mixing bowl over a saucepan filled with boiling water. Add the chocolate and butter gradually until melted. Remove from heat and stir consistently. Cool for 10 minutes. In a separate mixing bowl, combine the whole eggs, yolks, and sugar; whisk until thick. Slowly add the chocolate mixture while whisking. Sift flour over the mixture while folding it in with a spoon. 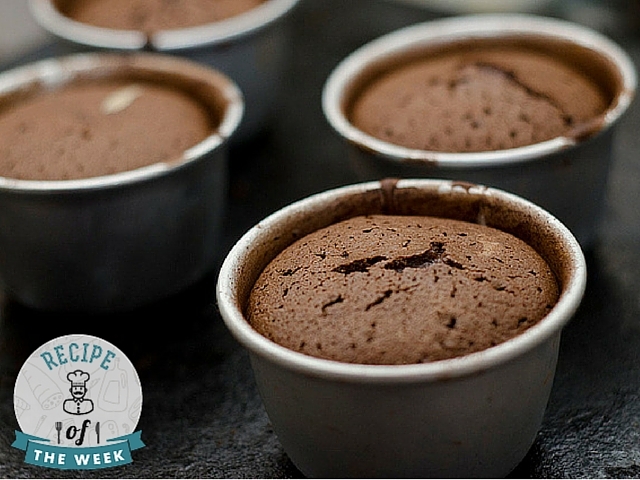 Pour the chocolate mixture into the ramekins; bake in oven for 12 minutes. Remove ramekins from oven; use a plate to flip the chocolate pudding onto the plate and serve.